If you are wondering, how much does palm tree trimming cost in Phoenix, Arizona, this post should help! On average, palm tree trimming in Phoenix costs about $637.50 in 2019. The size, the shape, and the health of your palm will have an impact on how much it is going to cost you to have it trimmed properly. Trees that are kept trimmed on a regular basis is going to need less work, meaning it’s going to cost less. On the other hand, should your tree(s) need a lot of caring for, the cost is going to be more. Palm trees that are as high as 30 feet will usually cost around $75 to $400. To have a medium palm tree trimmed it generally costs in the range of $130 to $800, according to the ‘Liberty Tree Experts’, and palms that are as high as 60 feet and taller, will usually cost in the range of $200 to $1,200. If you are needing a more accurate cost please contact us, and we can come out and give you a on your Palm Tree(s) to be trimmed. Should your palms appear shabby and they are in need of being trimmed for their health as well as their appearance, give us a call. Whenever you give us a call or contact us via email, we can work on trimming your palm tree(s) right away. We will always offer you affordable and competitive prices when taking care of your palm tree(s) in Arizona. We provide our services for trimming palm tree(s) for both, residential and commercial properties located in Phoenix, Chandler, Glendale, Tempe, Mesa, Scottsdale, Gilbert, among all the other cities in the Phoenix Metropolitan area. Let us come out and show you what we can do for your palms, and what they can do for your landscape! How Much Does Palm Tree Trimming Cost In Phoenix, Arizona? The health, shape and size of the palm tree all have an impact on how much they cost to trim. Trees that are well managed and trimmed on a regular basis will cost less than a palm tree that never gets trimmed. The average cost of palm tree trimming in Phoenix is around $637.50. 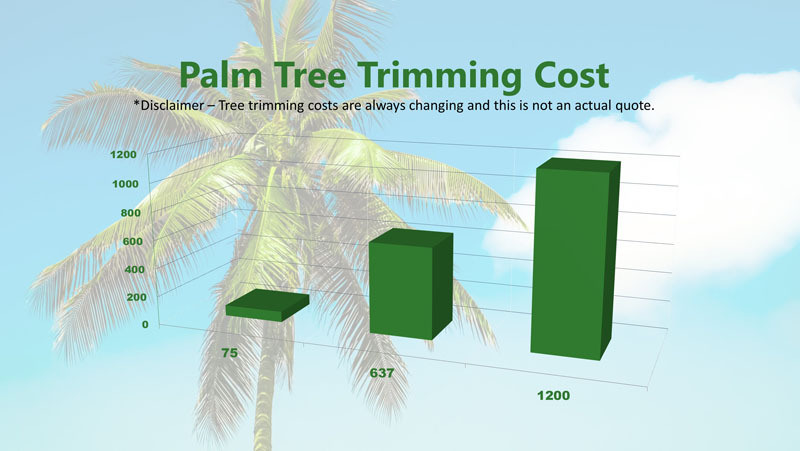 See below for small, medium and large palm tree trimming costs. Small palm trees that are 30 feet and under will cost in the range of $75 to $400. Palm trees that are somewhere between 31 feet up to 59 feet will be in the range of $130 to $800. Large palm trees that are 60 feet and over runs in the range of $200 to $1,200. If you are interested in receiving a free quote on the cost for Palm Tree Trimming from anywhere in the Phoenix Valley, let Arbor Care Help! We provide affordable Palm Tree Trimming services in Phoenix, Scottsdale, Chandler, Scottsdale, Gilbert, Glendale, Mesa, among others. Remove those sick or dead Palm Trees and enhance your residential yard or commercial property. As there are different packages in which you can easily trimmed your tree securely and hassle free. Small palm tree plan is the cheapest plan to trim tree and covers approx. 30 feet of the tree Whereas large palm is costly one and it will cover approx. 60 feet of the tree.